A firefighter sprays water on a burning home in the wealthy Bel-Air neighborhood during the Skirball Fire on December 6, 2017 in Los Angeles, California. Strong Santa Ana winds are rapidly pushing multiple wildfires across the region, expanding across tens of thousands of acres and destroying hundreds of homes and structures. This article is no longer being updated. For the latest information on the Skirball Fire, click here. Firefighters Saturday improved containment lines around the 4-day-old Skirball Fire in the Sepulveda Pass and Bel-Air to 75 percent, authorities said. The fire that started early Wednesday on the east side of the San Diego (405) Freeway near Mulholland Drive has scorched 421 acres, destroyed six homes and damaged 12 others while prompting the evacuation of about 700 homes and an apartment building. 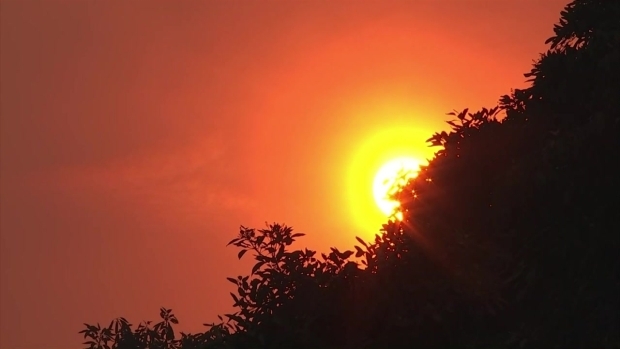 The amount of acreage was adjusted down today from 475 acres due to more accurate mapping, the Los Angeles Fire Department said. Some evacuees were allowed to return home Friday. One firefighter suffered neck burns and was treated at a hospital, authorities said. Another firefighter suffered minor injuries. The fire has been kept on the east side of the freeway. Mandatory evacuation orders remained in place today for residents north of the 1000 block of Linda Flora Drive, south of 1894 Linda Flora Drive, and a stretch of Moraga Drive north of the security gate entrance. Casino Road, south of Stephen S. Wise Temple, is open to residents only. Stretches of Bellagio and Casino roads from Moraga Drive were also opened Friday. Evacuation orders covered a large area bounded by Mulholland Drive to the north, Sunset Boulevard to the south, the San Diego Freeway to the west and Roscomare Road on the east. 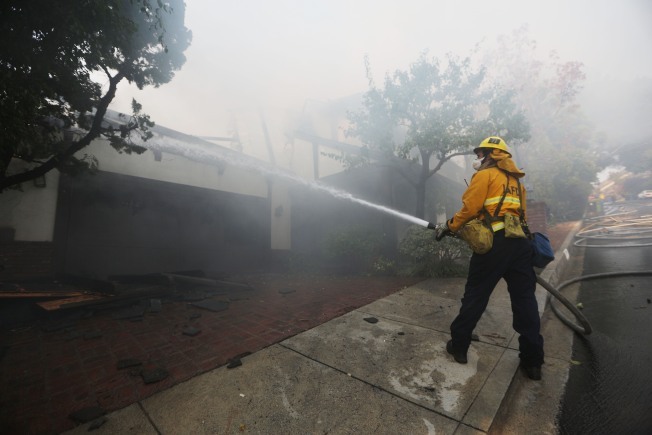 The exception to the evacuation order was the Bel-Air Crest housing development, which was not threatened, according to Los Angeles Mayor Eric Garcetti. The Getty Center and the nearby Skirball Center, both on the west side of the freeway, reopened Friday. Classes at UCLA, Cal State Northridge, Los Angeles Valley College and Santa Monica College resumed Friday after being canceled Thursday. All Los Angeles Unified School District schools in the San Fernando Valley and some on the west side of Los Angeles -- a total of 265 district schools and charter schools -- were closed Thursday and Friday, They are expected to be open Monday. The Santa Monica-Malibu Unified School District closed all of its schools Wednesday and Thursday. Schools in Santa Monica reopened Friday, but Malibu schools remained closed. The fire burned in the same general area as the devastating Bel-Air Fire of 1961. That blaze destroyed about 500 homes and led to various policy changes, including a prohibition on wood-shingle roofs and the strict requirement to clear brush around properties. What sparked the Skirball Fire has not been determined.